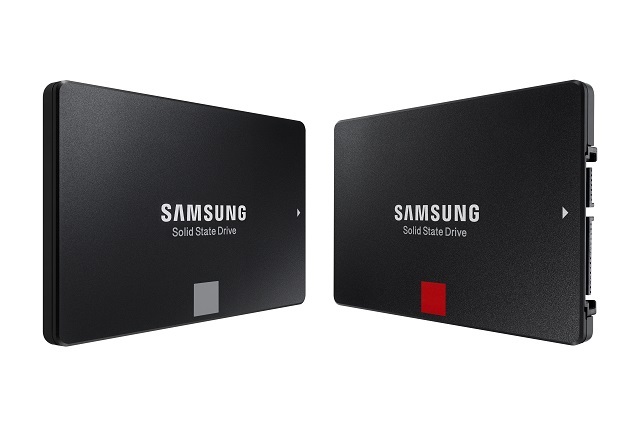 Samsung has added two new consumer-grade drives to its extensive storage line-up this week. The 860 PRO and 860 EVO. Both drives are based on Samsung’s 64-layer V-NAND technology with the 860 PRO using 2-bit per cell MLC and the EVO using 3-bit per cell MLC. Samsung has added their updated MJX controller and LPDDR4 for faster communication between the host system and the NAND flash modules. The 860 PRO will be the higher end of the two models and offers up to 560/530 MB/s sequential read and write speeds with max random read and write speeds of 100K/90K IOPS. The PRO is available in sizes ranging from 256GB to 4TB in a 2.5″ SATA III form factor and features varying sizes of LPDDR4 roughly in step with drive capacity up to 4GB for the 4TB model. The PRO also carries a 5-year warranty or up to 4,800 TBW (Terabytes Written). The 860 EVO offers an expanded product line compared to the PRO. It has the same availability in the 2.5″ form factor but has added M.2 SATA models from 250GB up to 2TB and mSATA models from 250GB up to 1TB. The lineup features sequential read and write speeds up to 550/520MB/s and max random read and write speeds of 98K/90K IOPS. The EVO also includes LPDDR4 DRAM buffers as the PRO version does and carries a 5-year warranty but a reduced TBW of 2,400. It will be interesting to see benchmarks on the newer drives. It seems to me that the peak throughput is more or less limited by the SATA bandwidth. I wonder if there will be significant improvements in other measures such as random read/write performance that may more closely match typical usage patterns. From Samsung's product page specs on the 860 EVO, 500 GB. How does the Samsung 860 EVO compare to the WD Blue 3D NAND?